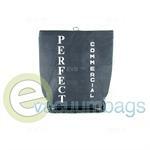 Certified to HEPA Filtration standards, Perfect Vacuum bags provide superior dust retention. These multi-ply cloth filter bags capture microscopic airborne particles such as mold spores, pet dander, and pollen that might otherwise escape a standard paper bag. Having trapped pollutants within the bag, Perfect Vacuum bags provide cleaner air and relief for those who suffer from allergies, asthma or other breathing concerns, and making a better environment for all. HEPA certified filtration captures 99.97% of all airborne allergens down to .3 microns in size. Platinum vacuum bag's efficient bag filtration also helps prolong the life of the vacuum’s motor and any other filters within the vacuum, minimizing the amount of dust that passes through the motor. Also fits Oreck commercial backpack vacuums XLPRO6, XLPRO6A, and XLPRO6Z. 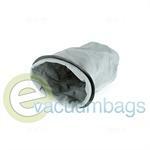 Perfect outer cloth replacement vacuum bags are also available for many Perfect vacuum models. Replacement 6 Quart Micro-Lined Cloth Vacuum Bag for Perfect Backpack Commercial Model Vacuum PB1006. Dirt Cup Cloth Bag for Titan T205 Model Vacuums.